Do you miss Chinese food as much as I do? Generally speaking, Chinese food is packed full of carbohydrates from the rice to the noodles, fortune cookies, and the hidden carbs in the sauces. It is a tough food category. The thing that turned it all around for me was Miracle Noodles or shiritake noodles. If you have tried them and did not like the texture I will tell you that I was right there with you….at first. I read several blog posts to glean the experience of others that have tried and love them. The research led me to a new appreciation for this carb-free ingredient. The answer to a great texture requires a three pronged approach. #1 Open the package of noodles and strain them to remove the liquid. Rinse them for several minutes under warm water. #2 Boil the noodles on the stove top. Honestly, these noodles do not smell great coming right out of the package. Putting them in the boiling water for a few minutes really does remove the unpleasantness. #3 Place the drained noodles in a dry pan over medium-high heat. Move them around in the pan occasionally to avoid sticking. This step is imperative! You want to remove as much of the liquid as possible. I found that they made a different sound in the pan when they were finished drying and ready to take off the heat. Removing the moisture in the noodles gives them a texture that more resembles that of rice noodles. Megan and I really enjoyed this recipe. It is full of flavor but without all the hidden carbs. Satisfying cravings with modified recipes will really help you stay on track. It isn’t about giving things up completely and depriving yourself. The idea is to take the things you love and make them work with your new lifestyle. Enjoy! In a medium bowl, mix together 2 tbsp soy sauce or Tamari with 2 tbsp sesame oil. Add the raw shrimp and stir to coat with the sauce. Refrigerate for about 30 minutes. I marinate the shrimp first so that it’s ready when I am done prepping the Shiritake noodles and vegetables. 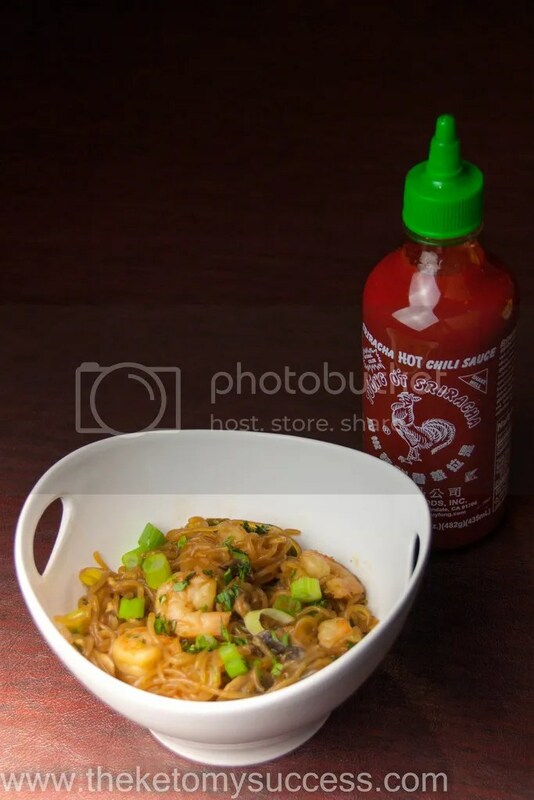 Open both packages of Shiritake noodles, put them in a strainer and rinse them thoroughly. Next, boil them on the stovetop for 2-3 minutes. Finally, heat a large saute pan or wok over high heat. Drain the boiled noodles and add them to the wok. This step is important! You want to remove moisture from the noodles so that they have a good texture. If you don’t dry them, they can be chewy but drying them gives them a texture similar to rice noodles. Make sure to continually move the noodles around in the dry pan to avoid sticking. Remove noodles and set aside. Heat 1 tbsp of the coconut oil in the pan or wok. Add the marinated shrimp and cook just until the shrimp turns pink. You will only cook the shrimp for 2-3 minutes. Once you have nice pink shrimp, remove them from the wok and set aside. Add the mushrooms to the pan and again cook for 2-3 minutes until they begin to brown and slightly soften. Remove and set aside. Next, add in the garlic, bok choy, steamed broccoli and green onions. Cook 2-3 minutes until the bok choy begins to wilt, slightly. Take the wok off the heat and add back in the mushrooms and noodles. Whisk together the sauce ingredients and stir into noodles and vegetables. Put wok back over heat and cook for several minutes until sauce soaks into noodles and reduces slightly. Finally, add back in the shrimp and cook just long enough to reheat the shrimp. This can be served topped with thai basil, cilantro, or some toasted sesame seeds.